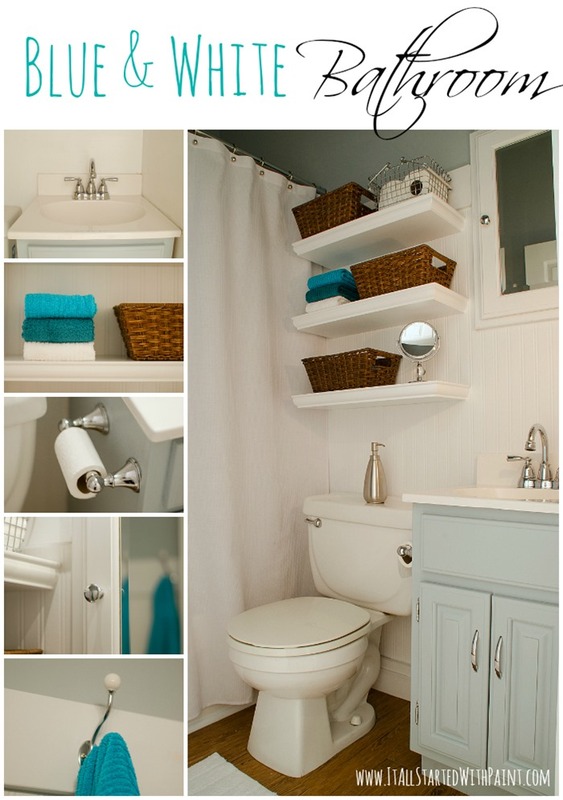 Blue and White Bathroom: Small Space Solutions. Have I ever told you the story of how we found our house? Or that we barely even looked at any houses before deciding on this one? Or that we had a 5-7 year plan for this house …. and here we remain 19 1/2 years later? and got a tour by the owner. He was a contractor. And he and his wife lived in the house as they renovated it. And he shared the details: original mouldings couldn’t be saved because they were painted with outdoor paint; roofs were raised to add more square footage on the second floor; the home was first built in the late 1880’s. He even showed me a scrapbook of the renovations. and Ace Hardware’s expert spokesperson. even though the folks at Ace Hardware had no idea that I bought my home from their expert spokesperson, Lou Manfredini. I know. I hold my head in shame. 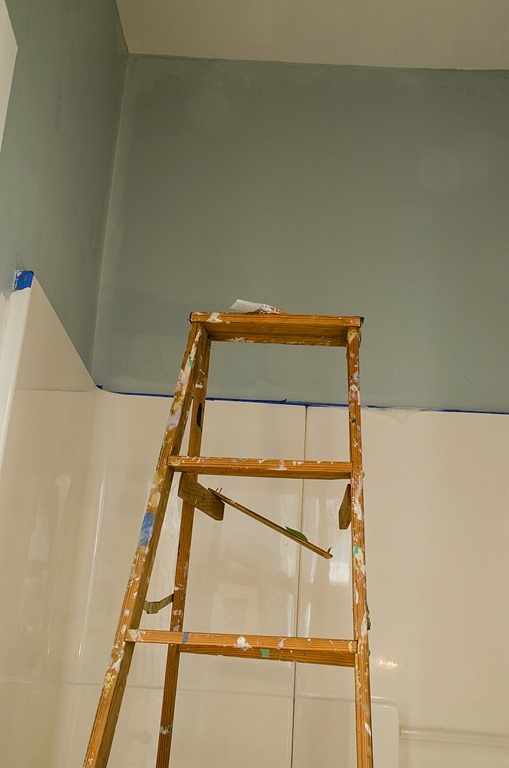 when I painted the ceiling with Ace Hardware’s ceiling paint. 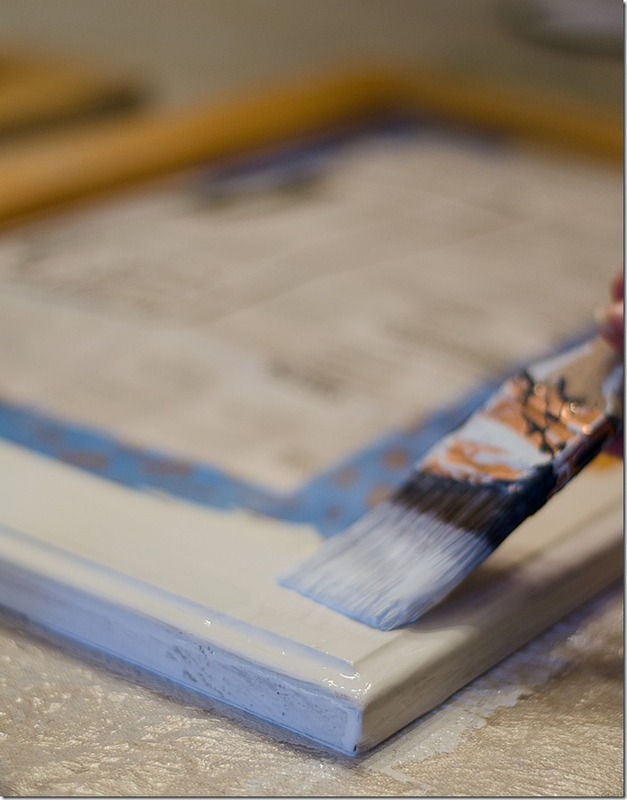 And painted the beadboard wallpaper (I’ll share how I hung it at a later date) with Clark & Kensington Designer’s White. The cabinet received a second coats of the Cabinet, Door & Trim paint. Install and decorate. The shelves went up. The upper cabinet door received hardware and was reinstalled. no more soggy towels on the floor! even though it was 19 1/2 years in the making. This post was written as part of my partnership with Ace Hardware as a member of the Ace Blogger Panel. However, any and all opinions are my own. Wow! Busy weekend – looks fantastic! It looks beautiful! I can’t believe you got it all done in a weekend! What a great transformation! Love it! Well all of your work sure paid off! It’s gorgeous Linda! The room looks super. You really ACED it. How did you like that aloud paint? Love the daily breakdown you did! It turned out beautifully and it looks so fresh and new now. Amazing work! 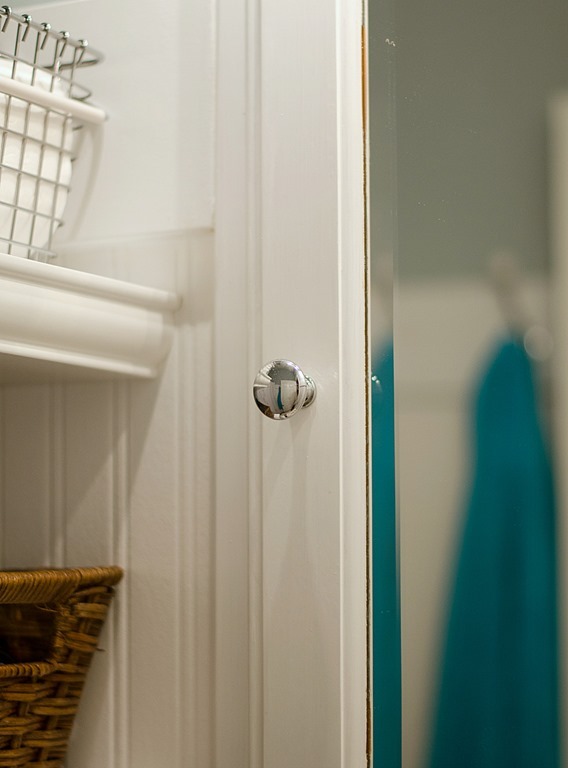 Your bathroom makeover looks fantastic no matter how many years it took to get to this project. I have a list a mile long and a budget an inch long, so I bet I’ll have some 19.5 year projects. 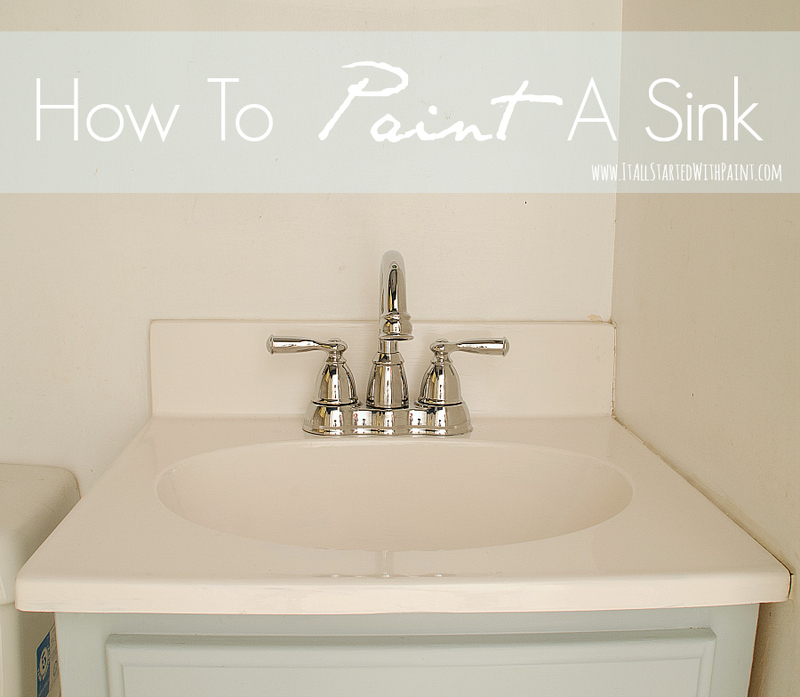 Love the paint color on the walls and sink.It’s such a pretty room now. Do you mind sharing where you got the shelves? I am looking for something like them for my own bathroom. HI Linda- I have the same shelves ready to be mounted in my small bathroom. How far apart are the shelves? I have the exact same shelves ready to hang in my tiny bathroom over the toilet. How far apart are the shelves spaced? I am struggling with what is the right # of inches. Man Oh Man, you did have a busy weekend but the final make over looks Awesome. Doesn’t look like the same bathroom. You done one heck of a fantastic job. Love the way your bathroom turned out. Where did you get the shelving? I really like them. HOLY CRAP girl!! I can’t even believe you did this in a weekend! It looks so incredibly beautiful! 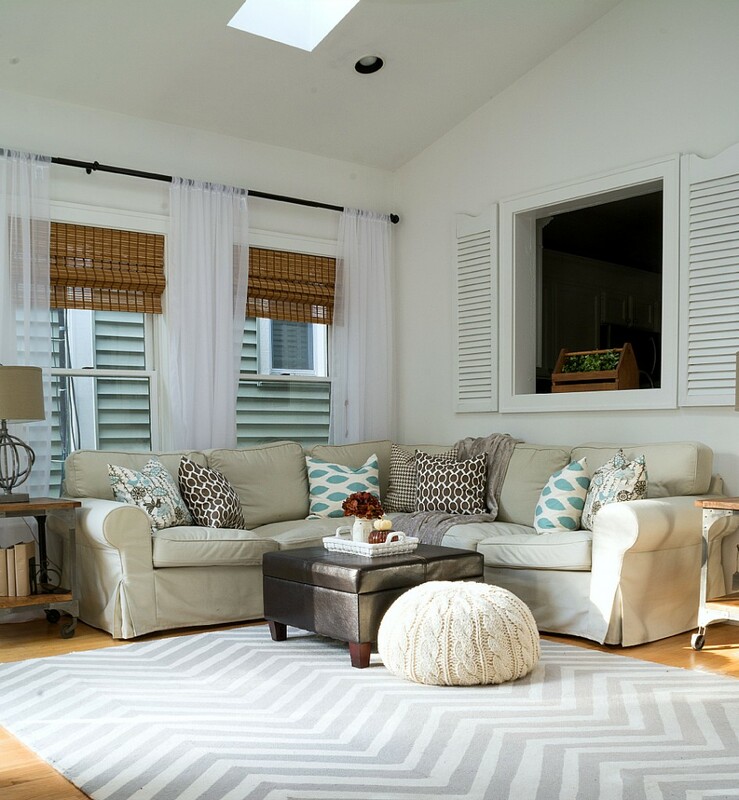 I am dying over that beadboard and the gorgeous white chicness. Beautiful! 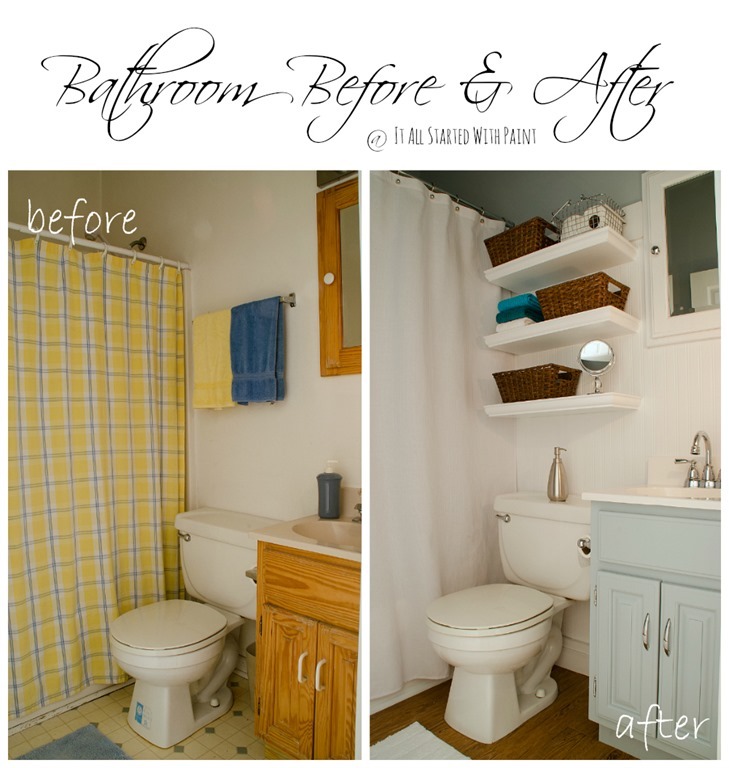 Will you PLEASE come and makeover my bathroom!?!? I’m still on coat #1 of painting the shower surround….3 months later! 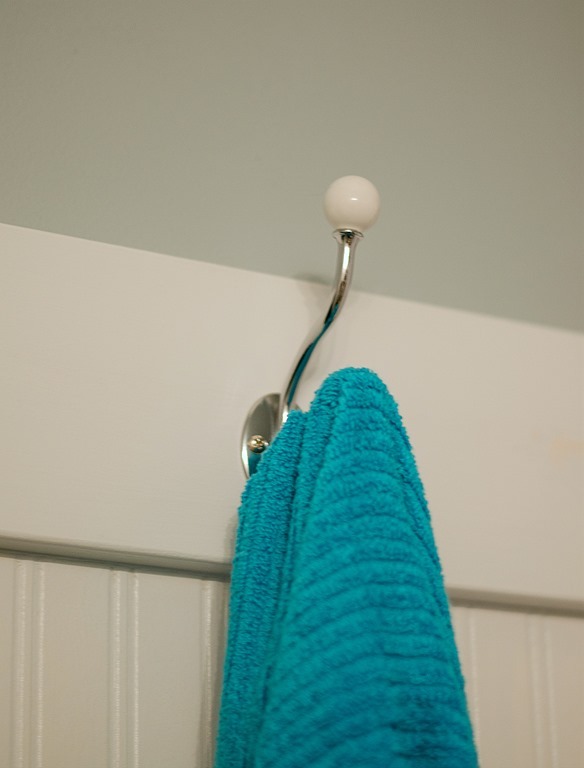 It’s GORGEOUS…I love the towel hook, the color of your cabinet and your SHELVES. 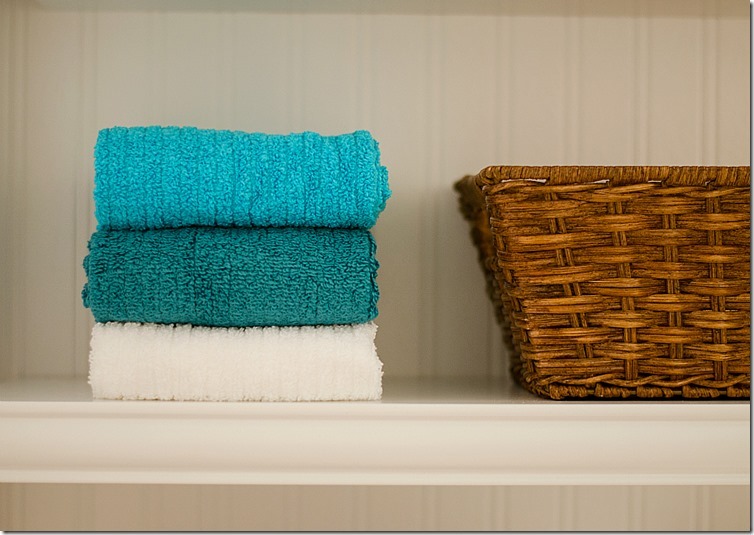 Sigh…I live for shelves…and maybe a faucet. 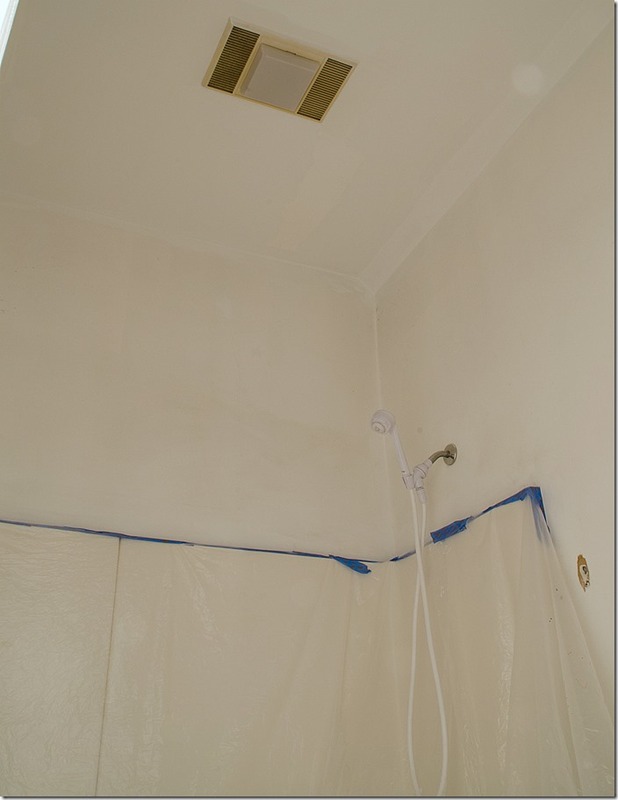 Okay, all I really want for Christmas is for the shower to be finished…and maybe a couple of doors that open and close without use of a hammer and screwdriver. You ROCK..and so does Ace and, of course, Lou. Can I call him Lou? figure that I can because you know him….and I know you. That counts, right!? Wow-looks great. 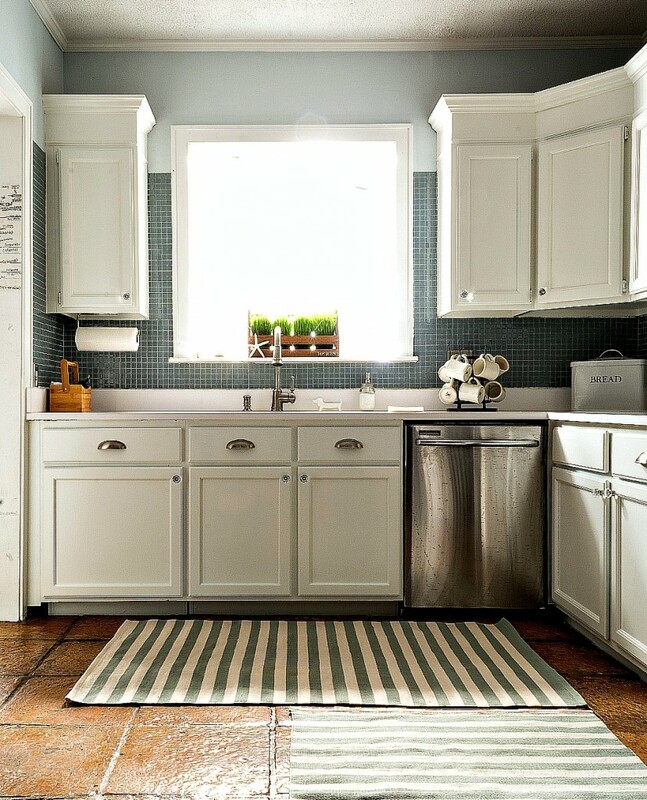 What did you paint the lower cabinet with? You only mention the upper. was it the same paint? I’m looking to hang shelves just like yours. Did you buy them or build? 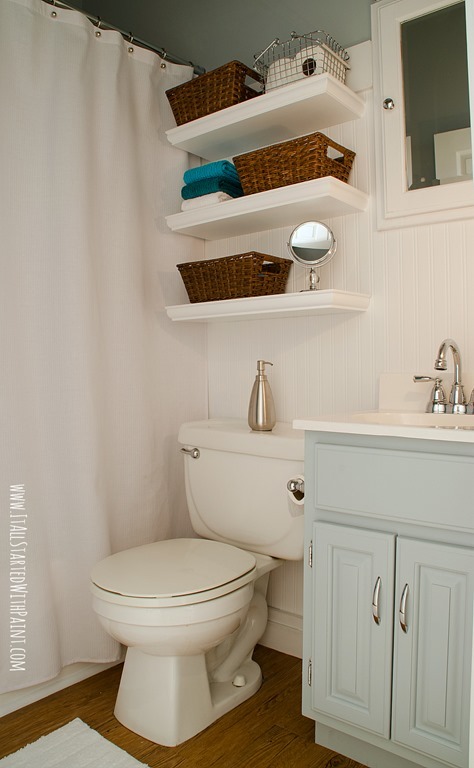 A small bath looks so much more airy with floating shelves, I’m just not sure how to go about it. Great job on the spruce-up! Looks awesome! What a transformation in a weekend! It looks beautiful! 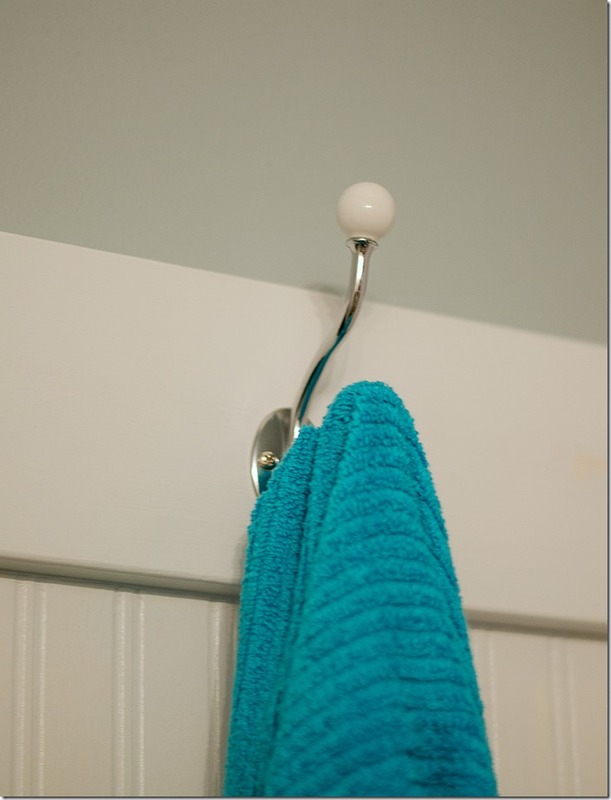 I love it so much I featured your bathroom paint color on my blog today. Thanks so much for the inspiration, you did a wonderful job. Have a great weekend! 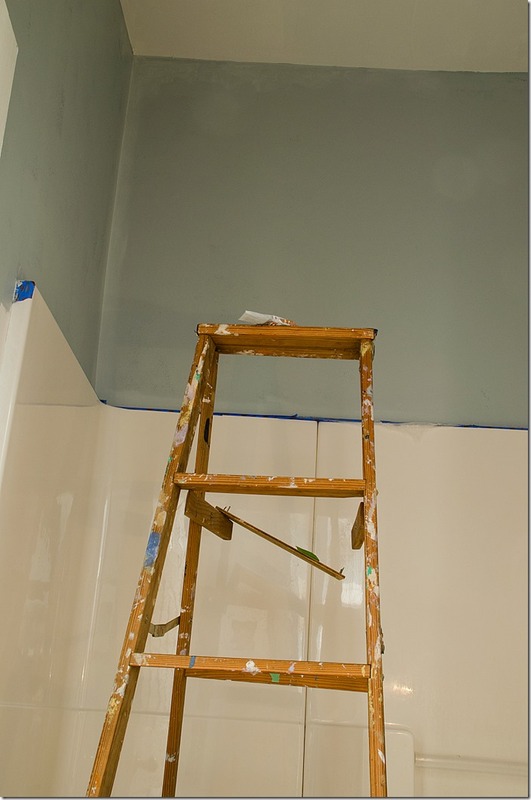 I am curious about the walls … Did you add white panelling??? if so what is it ?? ?I would like this in my bathroom as well! It’s impossible to get a bigger picture view of the bathroom. The space is tiny, tiny and there’s a wall right across from the door so I just can’t get the right perspective. 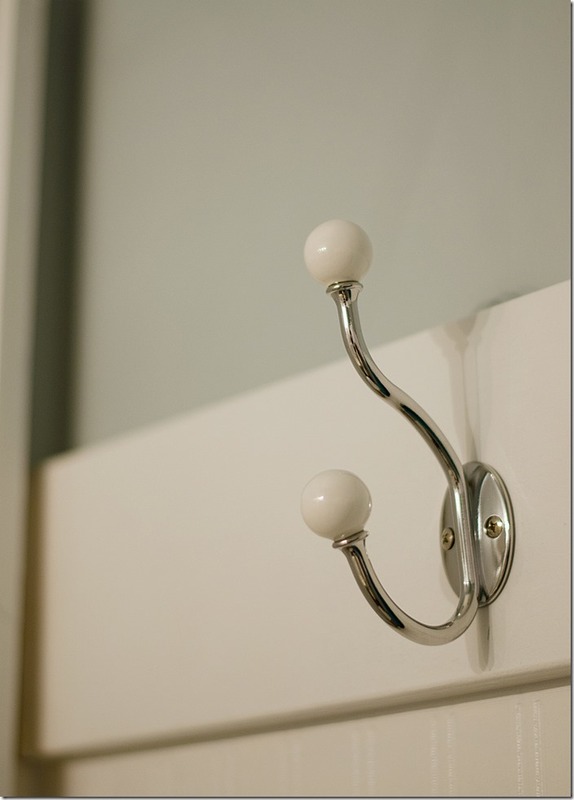 But the hooks are on the wall behind the door. They’re located opposite the sink & toilet. Beautiful bathroom! Can you share the paint type and color used on the vanity cabinet? What color is the vanity cabinet painted? I’m reading this in 2017, how does the re-painted sink look now? Does it hold up for a few years or a bunch of years? It’s definitely not a permanent solution and won’t last more than 4-5 years or so without damage. 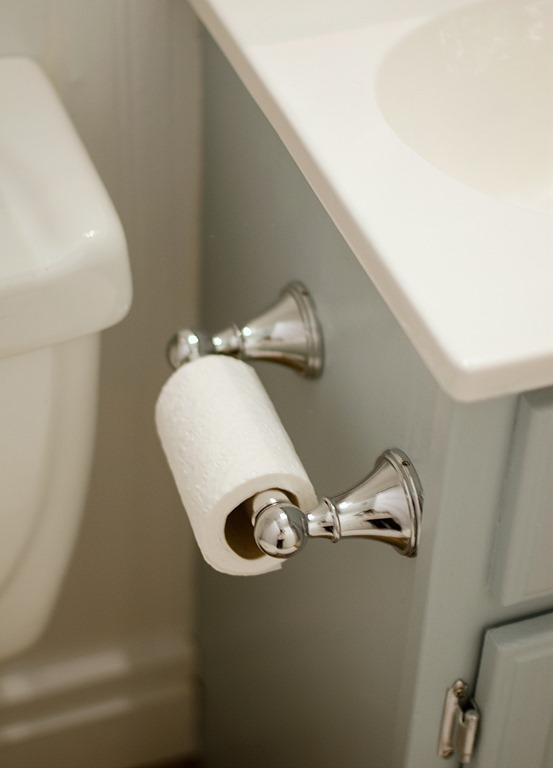 Plus, this particular bathroom is used by the kids (now teens) so it’s taken a beating! I do see discoloration now and some scratching of the finish. However, it’s still an improvement over what was there before! 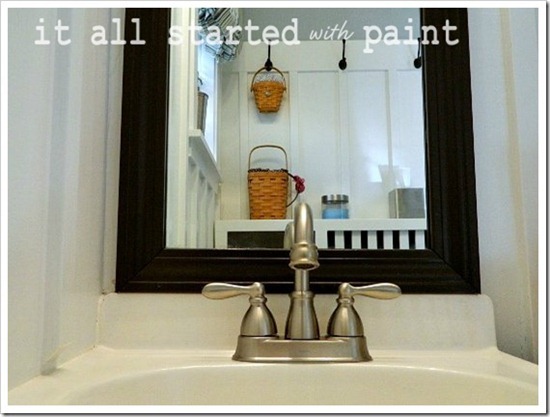 What color paint did you use on your sink cabinet? I absolutely love it! It’s Clark & Kensington in Lucky Charm. The brand is only available at Ace Hardware.